He urged the U.S. and other nations to resolve their trade conflicts — a key downside risk the IMF has repeatedly warned about since President Donald Trump began imposing tariffs last year. 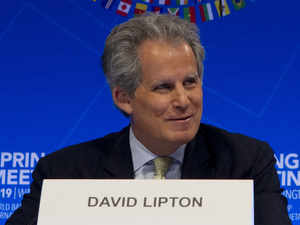 “The last thing we want is another downturn,” Lipton said, on the sidelines of the fund’s spring meetings in Washington. The threat of political missteps is looming over the global economy amid a backlash against free trade that has fueled the rise of populist governments around the world. The IMF this week downgraded its outlook for world growth in 2019 to the lowest since the financial crisis a decade ago, as conditions worsened in most major advanced economies. The US and China are locked in tense negotiations aimed at ending their nine-month trade war. Even if they do come to an agreement, a trade deal between the world’s two biggest economies could have unintended consequences if China commits to purchases of U.S. goods that crowds out imports from other countries in Asia, the head of the IMF’s Asia-Pacific department Changyong Rhee said Friday. There’s also a risk of new fronts breaking out in the trade war. The European Union is considering hitting 10.2 billion euros ($11.5 billion) of U.S. goods with retaliatory tariffs over subsidies to Boeing Co., according to a draft list seen by Bloomberg News. The plan follows a U.S. threat to seek $11 billion in damages through duties on European goods ranging from helicopters to cheeses to counter state aid to Airbus SE. Both moves stem from parallel, 14-year-old, disputes at the World Trade Organization over market-distorting support for aircraft makers. Asked about trans-Atlantic trade tensions, European Commissioner of economic affairs Pierre Moscovici said it’s time for the EU and U.S. to “cool down” and steer clear of a trade war. It’s “absurd” for the U.S. to consider the EU a threat like China, he said in a Bloomberg TV interview. In Europe, weakness has been particularly pronounced in Germany and Italy, though the baseline is for a gradual recovery, IMF European Director Poul Thomsen said at briefing in Washington on Friday. Meanwhile, Britain’s departure from the EU continues to drag. The U.K. was due to leave the EU on March 29, but has twice had to ask the bloc’s other 27 leaders for an extension. The latest plan, agreed this week at a summit in Brussels, is for the U.K. to depart the bloc by Oct. 31. May’s government is holding talks with the opposition Labour Party to see if they can agree a compromise deal that would be supported by Parliament. The challenge is “to find a way of delivering on that political decision of the British people in a way that protects our economy, protects British jobs and British prosperity,” he said. In emerging markets, investors were reminded of the perils of government meddling in the economy when Brazil’s President Jair Bolsonaro ordered state-owned Petrobras to refrain from increasing diesel prices on Thursday. The hastily-made decision revived fears of interventionist policies that plagued Latin America’s largest economy under previous governments. To be sure, there are signs that the global economy may be turning the corner. The IMF is stopping short of predicting a recession. Growth will recover in the second half of the year, said Bank of Japan Governor Haruhiko Kuroda, noting that China’s stimulus measures are having an effect.